As hobbies go, running is pretty cheap. If you’re barefoot running, then you don’t really need any equipment at all, and the location for your passion is right outside your front door, free of charge thanks to Mother Nature (and the local council). Of course, in 2012, a person’s passion amounts to a marketing opportunity, and there are a million companies that have worked out how to turn a buck from an activity that’s basically free to everybody. Training: I pay a coach to develop a running program for me, and to give me advice on technique, nutrition and marathon preparation. It’s group thing. We train together, with the coach, 2-3 times a week. It’s $80 a month. Equipment: I generally wear any old t-shirt, and people know that running shorts are a good gift for me, so shoes are about the extent of my own spending. Say 2-3 pair a year, total $300, or $25 a month. Events: Every couple of months, I enter some kind of race. Unbelievably, I never win the cash prizes associated with these, so the races are a cost. I’ll say $40 a month. Injuries: Occasionally I get twinges. These could be real or imagined, as a mate of mine points out. Both types require treatment. Massage, physio, faith healers and magic gypsies. $30 a month. So that’s an outlay of just $175 per month on a free activity. Not bad. Oh . . . . . . wait. How can I cut some corners here? My weekly kms have risen in recent months, in preparation for October’s Melbourne Marathon. In the past, this meant that I’d buy some energy gels to use during my “long run” each week. Another expense. $30-40 for a month or two. Ha! As both a DIY man and a tight arse, I spotted a savings opportunity! Energy gels taste awful. They’re messy, sticky things containing a cocktail of nutrients and, artificial god-knows-what. And they work. First time I used gels, I was amazed. Out on my feet one minute, and fizzing the next. Imagine what those Tour de France cheats must feel like on the serious Dr. Uggs! The low glycemic carbohydrate sports gels contain, help to raise blood glucose for a while, and that (apparently) does the trick. I decided to hunt around online for some “homebrew Gu” recipes. Here, here and here are good examples of what I found. There were many potions described aside from these, a lot of them with ingredients that I had no idea how to obtain. One common element kept on appearing though, in most (if not all) the mixtures that these backyard food science pioneers had concocted. 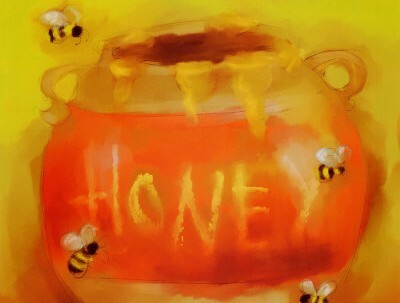 They’re mixing honey with this, they’re mixing honey with that, but seldom do they leave out the honey, Hmmm. A little further digging and I turned up this little beauty. Honey: The Natural Sports Gel. Basically, it’s a report on a university study claiming honey is about as good as energy gels, just on it’s own! The scientists at the uni tested subjects during exercise, each on several occasions. They fed them different kinds of goop as they went, to see what worked and what didn’t. Average power output also increased. Blood glucose and heart rate were increased by honey/sports gels with “no significant differences” observed in insulin levels. So, this turned out to be the easiest DIY job in history. To replace a sports energy gel, squeeze honey from the bottle. Done. Now . . . . the same university also produced a study that praises honey for its amazing properties as a post exercise food. These guys love honey! It’s cheap, natural, better tasting than the gels and Winnie the Pooh swears by it. Oh, and by the way, the study was funded by the US Honey Board, but so what eh! The University of Memphis has put its name to the work and after all, it doesn’t claim to cure cancer. I’ve been using honey on my long runs now for a few weeks and yes, it works. The energy “hit” arrives, and I don’t seem to have a sugar “low” after it’s gone. It’s pretty much the same as gels, like they said. I make my own little packets of honey, using plastic freezer bags. Taya (my very wonderful and enthusiastic daughter!) suggested we make a video about this bit. Here it is! I’ve been using 2-3 two on runs of 2.5hrs+, and I’ll use them in the Melbourne Marathon in October. It might well be all in the mind, but I’m going with it. Give it a go yourself. If you have any tips on how to make your own shoes or maybe you’ve built a treadmill from a couple of post-paks and a blanket, let us all know. How much honey contains a single shot ? Commercial gels have approx. 35g. Runners need between 30-60g of carbohydrate per hr. A tablespoon of honey is 17g. So try: 2 tablespoons of honey 30 mins, or one tablespoon every 15 mins. That’s the most you should need. Thanks for the video. Internet searches have suggested mixtures of maltodextrin, brown rice syrup, honey and molasses plus salts Na and K. All good ideas but what I liked best about the video you and your daughter made was the freezer bag containers. What a great idea! Thanks. Hi, I just found your blog, looking for ideas how to use honey during a marathon. I have a couple of questions, if you don’t mind. Did you actually try it during a race? How was it? How do you transport this honey bags – just in the pocket? And the most important – do you mix it with water during the run or just swallow without? Yes Marcin, I have used this method in one Marathon (last October). It worked the same as I have experienced gels to work in the past. I carried the bags in a small pouch/waist pack. Like an elastic belt with a small bag incorporated. There are many of these commercially available. I didn’t mix with water, but did drink at all stations. I’d say the honey helped, although the wall still caught up with me! Thx! I tried it too, but stomach problems hit me as well ; ) I was running middle distance for many years and I am not used to drink during races. A SPIbelt is what you were using there. I’ve done over 50 races with that belt, it’s awesome and it can easily hold 5 gels!